Albert and Victoria came to life in September 2001. 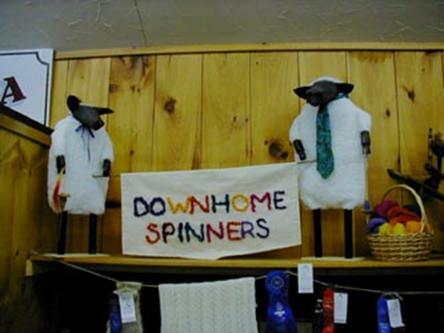 Their first appearance was in the Handspinners’ Booth at the Fryeburg Fair. Within a few days of their creation both had learned to spin on a drop spindle and gladly demonstrated their new-found skill to interested fair-goers. At the end of the fair week they were already making plans for the next year. After Albert and Victoria returned to the quiet of their home they were not content to stand in the closet and wait until next year’s Fryeburg Fair. Life should have a little more zest they thought. 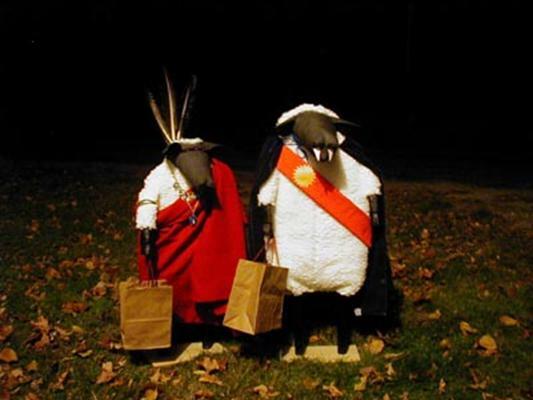 So on Halloween night they banged on the door and demanded to go trick or treating with the rest of the neighborhood kids! Albert was very sure that he wanted to be a vampire, but Victoria could not quite decide what she wanted to be. As Albert found himself a cape and made himself some long pointy teeth Victoria went through the drawers looking for inspiration. A soft length of red wool caught her imagination and wrapping it around herself she declared that she would be an Indian princess! She found a long silver chain, a bright enameled pendent and a jangling charm bracelet to fashion a necklace, and a wide silver cuff for an arm bracelet. Three long dark feathers and a braided headband completed her costume. A couple of handle bags and they were ready to ramble! No more closet for them! When they finally came in that night with their bags full they sat down and decided that they definitely would rather stay out all the time and be part of the family. They quickly adapted to life “on the outside” (of the closet). They learned to answer the phone, greet friends at the door, play tricks (like the time Albert pretended he could really bite the dog with his vampire teeth), join in discussions and watch TV. They really were looking forward to cooking the turkey for Thanksgiving but we went away for the holiday and had ham instead. 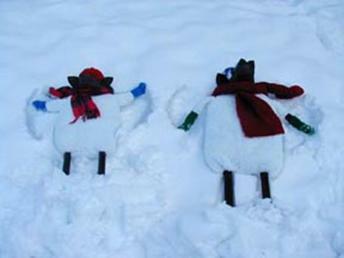 Undaunted, they got right into the spirit of the holidays. Donning appropriate hats and scarves they even went out and found their own Christmas tree. They had such a good time decorating the house, wrapping presents and sending their cards on email. Yes, they even mastered using the computer! It is much easier to tap the keys with their hooves than to put a stamp on a letter. Besides, they are too short to reach the mailbox. Their first winter the snow wasn’t really that great but it didn’t stop Albert and Victoria from having fun. The little hill out behind the house was just right for them. 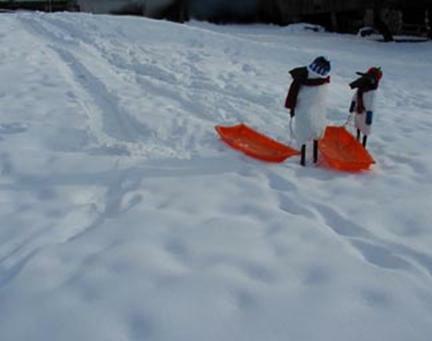 They went up in the barn and found the sleds and had a swell time. That day the sun was going in and out of the clouds and they had a fine view of the mountain, not much wind. Still, all that climbing back up the hill was tiring. So they put the sleds away and made snow angels before they shook the snow from their tails and came back inside to warm up. 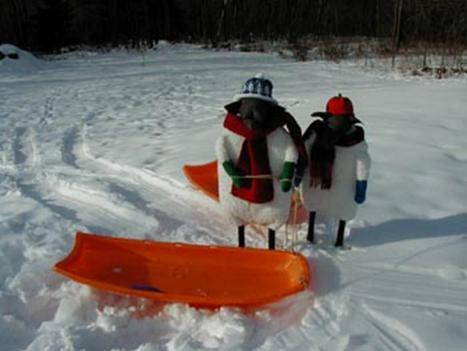 Since that first winter Albert and Victoria have had many adventures. Their exploits and daring has taken them all the way to Massachusetts and New York State. They have been around the world on the Internet! 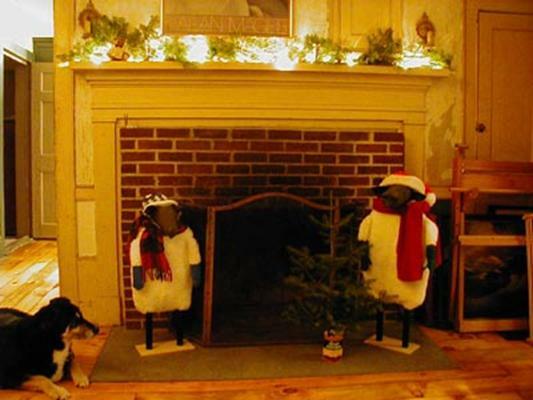 Every year they go back to demonstrate at the Fryeburg Fair, have been known to frequent other fiber events around New England, and, as unofficial mascots, are charter members of the New England Textile Arts group. When not traveling around as “ambassadors to the fiber world” they keep busy at home. They read widely, practice their cooking skills, do puzzles, and play games. Albert is much better at backgammon than Victoria, but she is better at doing puzzles. Sometimes they have friends in to visit. When the computer is not in use they keep up with other friends on email. Last summer they turned their hooves to gardening and had quite a nice bed of flowers and vegetables. You never know what they will get into next. Both learned to knit but only Victoria finished knitting her puppy hand puppet. Albert left his to read about model airplanes and is hoping to get a WW1 leather flying helmet and white silk scarf for Christmas.